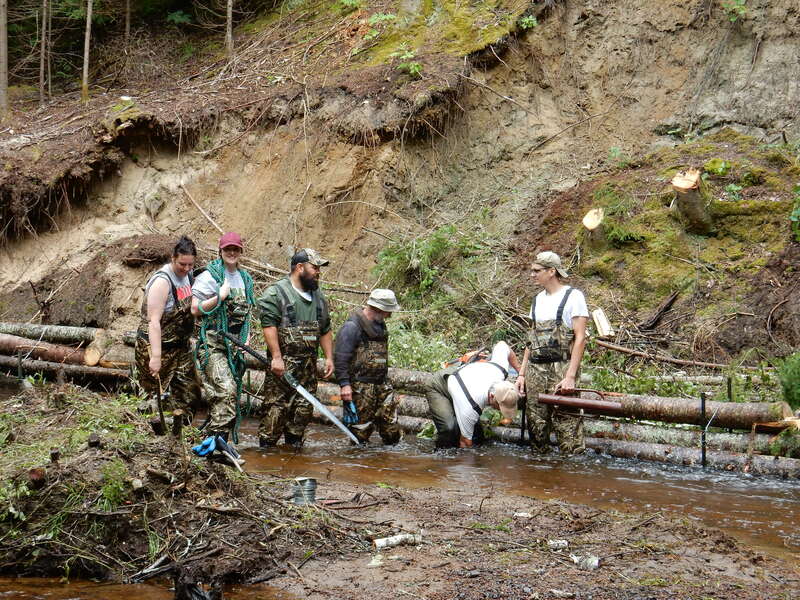 Over the course of this past summer, the Stewardship Council and the Nosbonsing Anglers and Hunters have been busy working on restoring a 2-km section of Depot Creek below Boulter Road back to its natural state. Flooding as a result of Hurricane Hazel in 1956, had a deleterious effect on Depot Creek. The rush of water eroded banks destroying natural vegetation and scooping up large amounts of sand and silt that choked the existing water channels and pushed the water to find new routes that were fractured, wider and slower than before. Long term stable vegetation was destroyed, ripped or eroded from the banks by the force of the flood leaving areas devoid of vegetation and vulnerable to colonization by opportunistic quick growing plant species without the shade and root characteristics essential to a coldwater stream. Natural catch basins and pools were lost as the material of the destruction from above settled out and smoothed the contours of the bottom flattening and widening water flow characteristics resulting in warmer water temperatures and more area susceptible to stagnation and aridity in summer and freezing solid in winter. 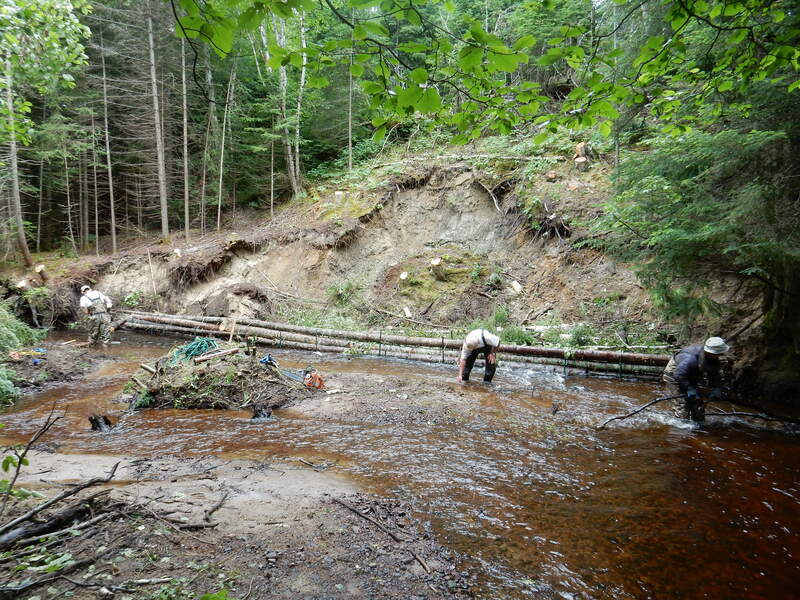 This project is working to rectify these characteristics and re-establish the creek closer to its original pristine state as a coldwater fishery – that will enhance the aquatic habitat for fish and other invertebrate species, largely through improved water quality (i.e. lower temperature, reduced sedimentation, increased dissolved oxygen, improved clarity). The work so far, has involved the placement of low log walls in combination with brush piles to stabilize the banks where they have been eroding and at the same time to narrow the width of these sections of the creek to increase the water flow. This in turn will deepen the channels and create pools of gravel and cobble clear of silt deposits. The sites completed in June were already having a positive and noticeable effect on the creek by the time work wrapped up for the season in September. Under the leadership of Paul-Emile Perron, Project Manager, and President of the Nosbonsing Anglers & Hunters, volunteers with his organization have logged approximately 600 person-hours to date. 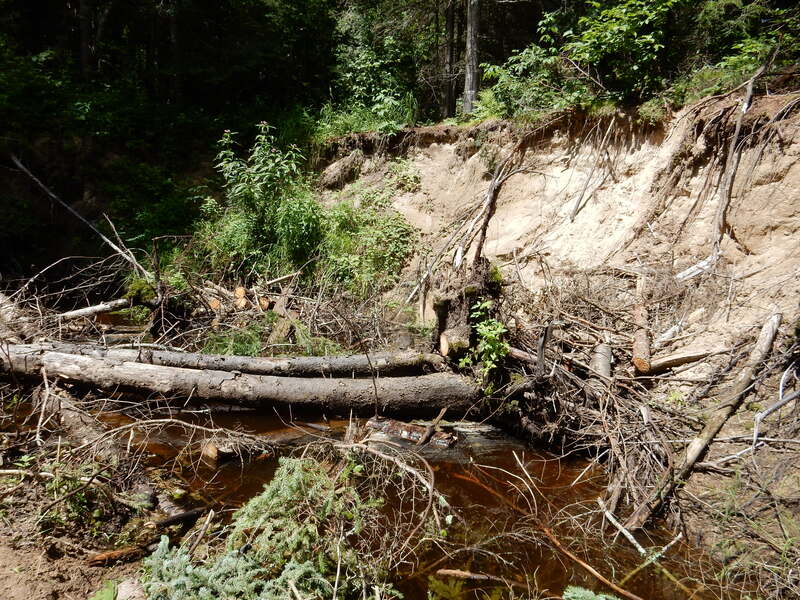 Volunteers for the 2 organizations will return to the creek next summer to complete the project, which will include the additional removal of alder and willow growth to reduce beaver activity; and planting of several hundred conifer trees. As appropriate, rock will be placed in the creek to improve aeration and provide eddies and shelter for fish and hiding places for aquatic inhabitants. The total project involves both sides of a four kilometers section of Depot Creek at a cost of just over $52,000 (cash and in-kind). The bulk of the funding is being provided from the federal Ministry of the Environment and Climate Control – Environmental Damages Fund, that was made available to the Stewardship Council and the North Bay-Mattawa Conservation Authority, for allocating to fisheries projects in the greater Nipissing area. Once completed, there will be follow-up monitoring to ensure the objectives of the project have been achieved. This information may potentially be used for additional remedial work on the creek. Anyone interested in helping rehabilitate Depot Creek, or with questions on the project can contact John Thornton at 705-753-2980 or by emailing info@greaternipissing.ca. The Tracking System is a collaborative research network that uses coordinated automated radio telemetry arrays to study movements of small animals across North America. Motus stations are now located throughout North America, and now, into South America and internationally. Although there are currently more than 350 Motus stations – each passively receiving tracking information from tagged animals, including birds, bats, and even butterflies – we still have some substantial gaps in coverage throughout northern Ontario, including here in North Bay. The two closest Motus stations, each with a reception field of 15-20 km in diameter, are located in Kawartha Lakes and at the Hilliardton Marsh in New Liskeard. This leaves a large gap in tracking migration routes through the North Bay / Nipissing Region. This area sees much activity through the spring and fall migration seasons – as any member of our Bird Wing will tell you! Read more about the local project here. The Stewardship Council has provided funding support to the Nipissing Naturalist Club for this project. For more information about MOTUS collaborative research network – click here. 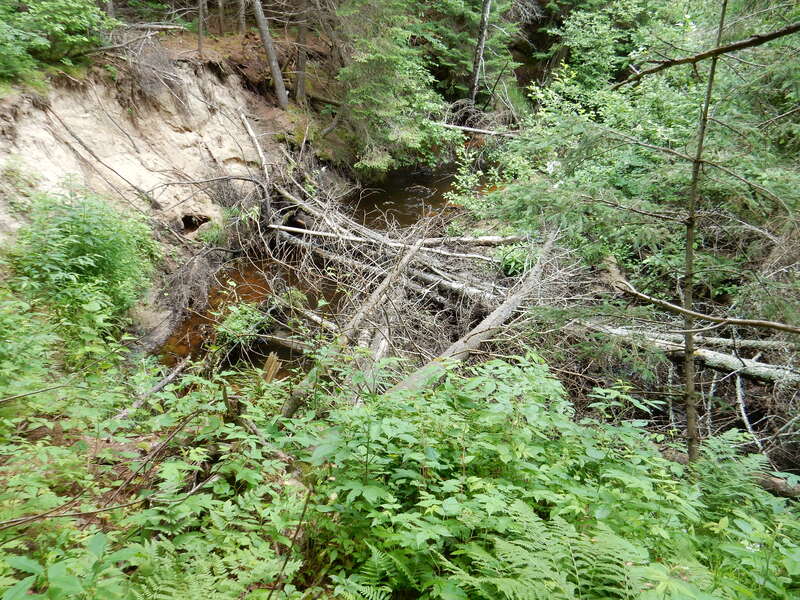 The North Bay-Mattawa Conservation Authority launched their Restore Your Shore program in 2015 to establish riparian plantings throughout the Authority’s watershed. The Stewardship Council provided funding support towards this project in 2016. 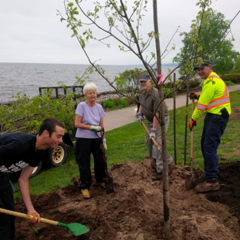 Over the course of the spring and summer 37 shorelines totalling 1.5 km were planted with 551 trees, 3,357 shrubs and 2,833 herbaceous plants (perennials) – all by volunteers who put in just under 500 hours. 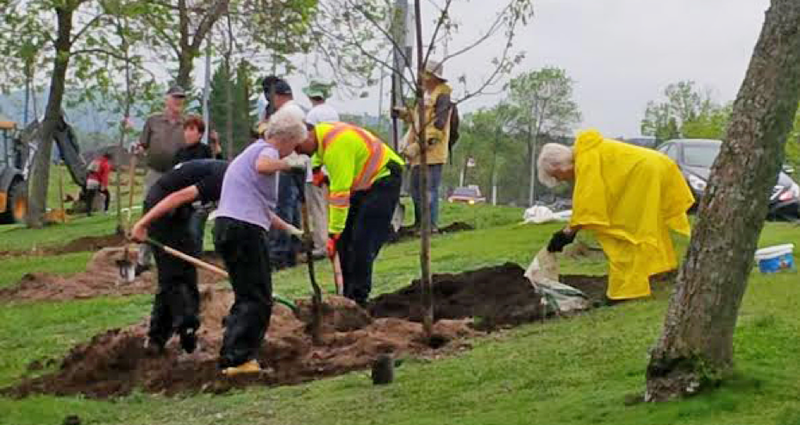 Approximately 20 volunteers turned out to help plant 140 trees along the North Bay Waterfront on May 30, 2015.The project was intended to replace 40 green ash trees with 40 trees of different species [listed on the left] which will be unaffected by Emerald Ash Borer. Due to a special deal with a local supplier, the project was able to acquire 100 more trees for the same price as the project funding of $8,000 for 40 trees. The Nipissing Botanical Gardens in partnership with the Greater Nipissing Stewardship Council are aiming to get a healthy tree population on the popular waterfront. 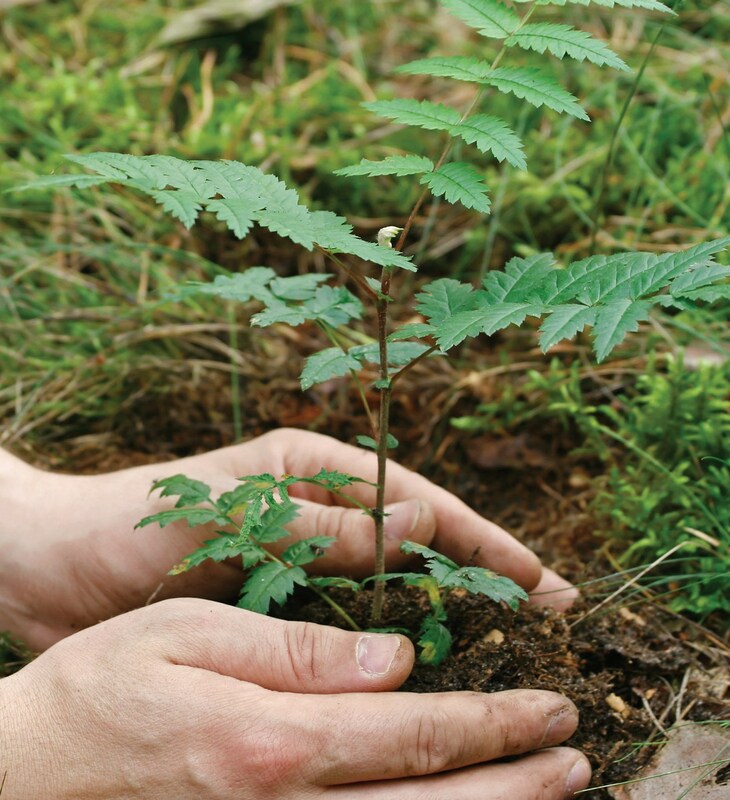 The species of the new trees include red oak, linden, red maple, and ironwood. 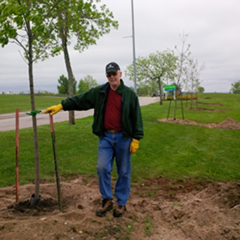 Walsh Craig informs that city crews will be planting red oaks in Lee Park in the upcoming week. 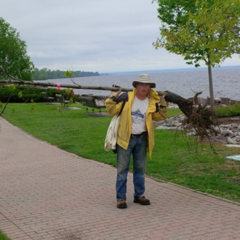 The city may also be planting white pine and white spruce on the waterfront in the future. “When we planted the last tree, we broke out into song. That’s how fun tree planting can be. It’s our gift to the community.” The oaks are expected to live the longest, usually 150 years of providing oxygen, shade, animal homes, natural beauty and healthy chemistry. 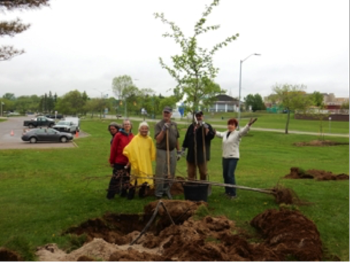 TD Friends of the Environment funded the event after the Greater Nipissing Stewardship Council applied for a grant to fund the tree program. 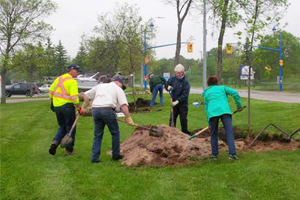 The North Bay Mattawa Conservation Authority provided the staff’s labour as well as equipment.The City of North Bay generously contributed by digging all the holes and storing the trees until planting. The Greater Nipissing Stewardship Council aims to protect, conserve, improve and restore the natural resources and environment of the greater Nipissing area.